The original Target Meister target system. It consisted of a target stand assembly and carrying bag. It has two configurations: rifle and pistol. The rifle configuration is low-profile and more stable in windy conditions. The pistol configuration raises the target to chest level for handgun training. The stand can be configured as a rifle or handgun stand, depending on your shooting needs. The handgun configuration (below left) is constructed using ten 30" poles. This gives the shooter a 60" high stand that is great for chest level acquisition or self defense training. Alternatively, when shooting rifle at 100+ yards, one may require more stand stability, particularly when sighting in. The rifle configuration (above right) is simply assembled by replacing the two lower 30" vertical poles with the two 5" poles. The rifle stand has a lower profile, is less susceptible to winds, and much more rigid. When shooting a rifle at 100+ yards, it really doesn't matter if your target is 35" above the ground or 60". Changing between the handgun and rifle configurations only requires the swapping of the lower vertical 30" and 5" poles. You're able to shoot up to two target stand poles and still stay in business. How you ask? Well, just replace the damaged pole with one from the base; they're interchangeable. The stand will be slightly less stable, but hey, you're still shooting and that's all that matters. Just remember to head back to TargetMeister.com and order some replacement parts. 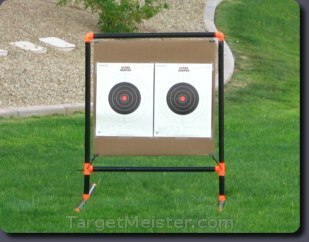 The target stand bag accommodates the entire target stand, including the rollable target backing. There is even enough room for extra parts and other shooting accessories. The bag makes storing and transporting the stand easy. It's peace of mind to know that when you're ready to go shooting, all you need to do is grab your guns and your Target Miester bag.